I have been on the Camino for just a week yet it feels much longer, perhaps because in some ways, each full day is the same. At the hostels, the lights go on at 6:30-7:00am, we repack our rucksacks, put our boots and packs back on and have to leave by 8:00a.m. Then there is a day of walking (and eating). During that time, I might take my pack off, and put it on again, ditto for the boots. In the afternoon, arriving at a new hostel, finding a new bed, we take our boots off, store them on a shelf, remove our packs, shower, wash clothing, rest, eat. Then, at 10pm, lights off. A few nights ago I had dinner with an American couple, in their 60s, in the one-restaurant town of Obanos. The wife complained about having to unpack her bag each night, make the bed, and do it all over again each day. “It’s Zen practice,” said her husband. 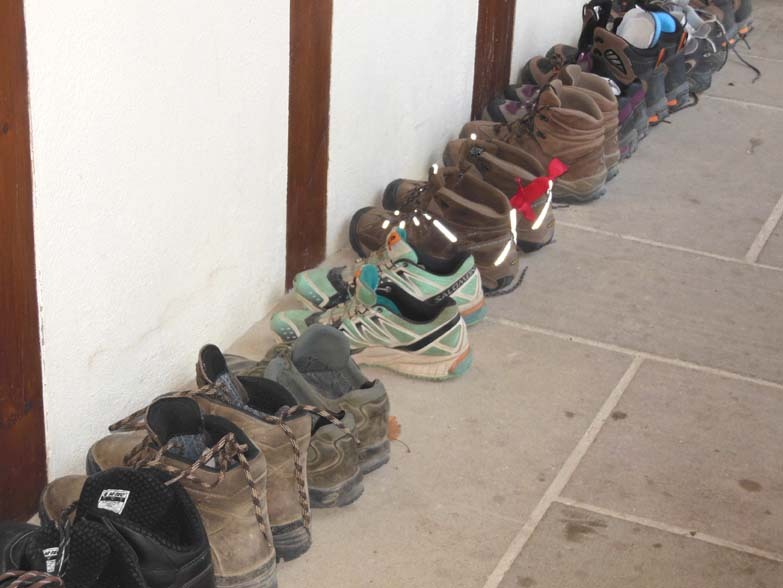 The Camino is like a walking meditation retreat that happens to be in Spain. I am reminded of my Zen teacher Cheri Huber´s saying, “How you do anything is how you do everything.” I’m trying to notice these transition points — pack on, pack off — and use them as times to check in with myself and the condition of my body and feet, see if I can organize my things more efficiently. Often, at the end of a day’s walk, I’m so spent and my joints so squeaky and achy that I can’t believe I will do the same thing the next day. It seems impossible. And yet, so far, when it’s time to leave and put the pack and boots on again and get my legs moving again, it’s hard to imagine doing anything else.